Recombinant fragment within Human p63 aa 1-250. The exact sequence is proprietary. WB: Human bladder, kidney and skin lysates; MDA-MB-435, PC3, PC-12 and A431 cell lysates. IHC-P: Human prostate hyperplasia, prostate, cervical carcinoma, tonsil and skeletal muscle tissue. ICC/IF: A431 and primary corneal limbal cells. 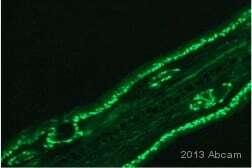 Flow cyt: A431 cells. Our Abpromise guarantee covers the use of ab124762 in the following tested applications. WB 1/2000. Detects a band of approximately 50-75 kDa (predicted molecular weight: 77 kDa). IHC-P 1/1200. Perform heat mediated antigen retrieval before commencing with IHC staining protocol. See IHC antigen retrival protocols. The different result in MDA-MB-435S is due to the lysate preparation method. If p63 variants are not detected in some samples, please try the 1% SDS hot lysis method. For lysate preparation protocol, please refer to the protocol book in the protocol section or here (downloadable copy). Immunohistochemical staining of paraffin embedded human prostate with purified ab124762 at a working dilution of 1 in 12000. The secondary antibody used is a HRP polymer for rabbit IgG. The sample is counter-stained with hematoxylin. Antigen retrieval was perfomed using Tris-EDTA buffer, pH 9.0. 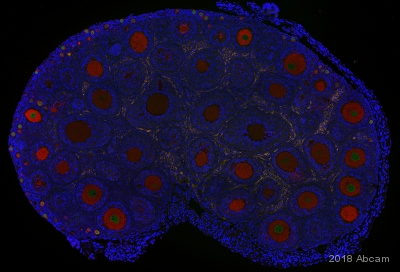 Unpurified ab124762 showing positive staining in prostate hyperplasia tissue. Overlay histogram showing A431 cells stained with unpurified ab124762 (red line). The cells were fixed with 80% methanol (5 min) and then permeabilized with 0.1% PBS-Tween for 20 min. The cells were then incubated in 1x PBS / 10% normal goat serum / 0.3M glycine to block non-specific protein-protein interactions followed by the antibody (unpurified ab124762, 1/1000 dilution) for 30 min at 22°C. The secondary antibody used was DyLight® 488 goat anti-rabbit IgG (H+L) (ab96899) at 1/500 dilution for 30 min at 22°C. Isotype control antibody (black line) was rabbit IgG (monoclonal) (0.1μg/1x106 cells) used under the same conditions. Unlabelled sample (blue line) was also used as a control. Acquisition of >5,000 events were collected using a 20mW Argon ion laser (488nm) and 525/30 bandpass filter. 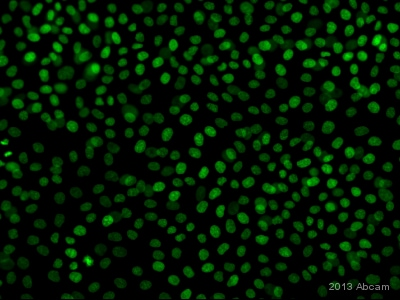 Immunofluorescent staining of A431 cells (fixed with 4% PFA and permeablized with TritonX 100) with purified ab124762 at a dilution of 1/60. 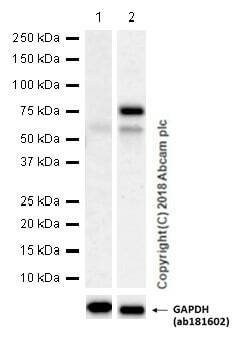 An Alexa Fluor® 488 goat anti-rabbit antibody was used as the secondary at a dilution of 1/200. 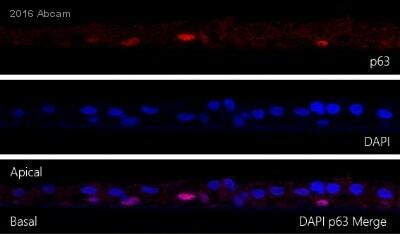 The panel on the right shows the DAPI counter-staining. Unpurified ab124762 staining p63 in Human corneal limbal epithelial cells (primary culture) by ICC/IF (immunocytochemistry/immunofluorescence). Cells were fixed with methanol and permeabilized with 0.3% Triton X-100 for 5 minutes. Samples were incubated with primary antibody (1/100 in PBS + 10% Goat serum) for 18 hours at 4°C. An Alexa Fluor® 488-conjugated Goat anti-rabbit IgG polyclonal (1/500) was used as the secondary antibody. Immunohistochemical staining of p63 in paraffin-embedded human cervical carcinoma tissue with unpurified ab124762, at a 1/500 dilution. Immunofluorescent staining of A431 cells (fixed with 4% PFA and permeablized with TritonX 100) with unpurified ab124762 at a dilution of 1/60. An Alexa Fluor® 488 goat anti-rabbit antibody was used as the secondary at a dilution of 1/200. The panel on the right shows the DAPI counter-staining. Unpurified ab124762 showing positive staining in normal tonsil tissue. Unpurified ab124762 showing negative staining in skeletal muscle tissue. Publishing research using ab124762? Please let us know so that we can cite the reference in this datasheet. Yes - 0.1% Triton-X 100 for 30 minutes at room temperature. Here please find the information about our testing discount program. Below I also include information about our Abpromise guarantee.